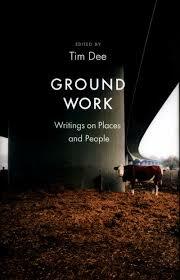 Tim Dee has edited a new collection of place writing called Ground Work. His introduction recalls an earlier version of the same idea, Ronald Blythe's Places (1981), which featured people like John Betjeman, Susan Hill, Alan Sillitoe and Jan Morris; it's mood was 'wistful and elegiac'. few years later, Richard Mabey's Second Nature (1984), made for Common Ground, included big names like John Fowles, Fay Weldon and John Berger alongside art by Henry Moore, Richard Long, David Nash and others. It too was predominantly backward looking. Ground Work aims to look beyond the picturesque and pretty, at places that are not famous but mean something special to the authors. However, this degree of attachment means that you will still encounter idylls of various kinds, though some have disappeared or have come under threat. It is a little hard not to envy some of these writers their childhoods out in nature or the time they have to spend in agreeable places (the Bodleian Library, a wilderness retreat in Finland, an old garden in the Cevannes...) There are authors who have been able to beautify a ninety-acre Sussex farm, buy a thirty-one foot sloop 'for a book project', or acquire a wood in order to restore it from neglect. I have to say though that this last example, in an essay by Richard Mabey, was a highlight of the book: his reflections on the moral quandaries of landscape management are fascinating. Photograph taken on my phone, earlier this week. Given my interest in art, I particularly enjoyed 'Tipping Buckets', the contribution by poet and edgelends explorer Paul Farley, which finds different metaphors in a piece of urban sculpture. The work in question can be found in a small square near the waterfront in Liverpool. As I was in Liverpool on Monday I popped down to see it, but sadly there was no sign of life - the buckets were not even 'chugging away in their backwater', they were still and the 'piazza' was empty. A lot of the writing in Ground Work focuses in on small sites like this - an allotment plot, a bridge, a back garden, a bird hide. However, in order to justify mentioning the book on this blog I will end here by highlighting an essay that features both landscape and poetry. 'At the Edge of the Tide' is by Michael Viney, a journalist and nature writer originally from Brighton, where I grew up, but resident in Ireland since before I was born. It describes the beach by his home, 'an acre on the wilder coast of County Mayo'. Through Morrison's fields and our imaginations. The Owennadornaun was the little river whose ford near the bottom of the boreen was so rich in the spirit of place. A sill of rock made a shallow waterfall just above the crossing, with the sun above the mountain to catch each ripple and splash. It was here I saw my first dipper, walking under water, and where, in summer, sand martins came to nest in holes in the bank. There were pied and grey wagtails dancing at the edge and, once or twice, a sandpiper.